Dave Crow at Den of Geek recently had a brief interview with John Logan, the creator of Penny Dreadful. Logan was nice enough to give us some huge hints about next year’s Penny Dreadful season. Here are some highlights. The Penny Dreadful crew is leaving London, no word where they might be headed yet, but it won’t be Transylvania. It’s possible we may see characters from The Island of Dr. Moreau and Dr. Jekyll and Mr. Hyde. 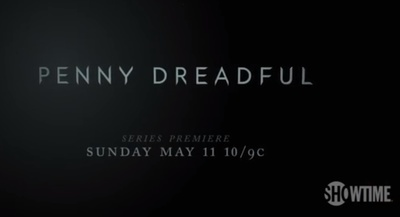 Penny Dreadful is also getting two additional episodes for its second season, moving from eight to ten. What did you think of season 1? Are you excited about the direction the show is heading for season 2? What are you most excited about? Is there something more you would like to see? Where are you getting these shows from? Perhaps this is another not yet in Australia -I thought I was almost a TV addict but thanks to you, I think maybe I am not as there as to o many I don't know!! I get the Sunday paper purely for the TV programme. Hi Finy, Penny Dreadful wrapped up it's first season a little while back. It was a huge hit in Canada and the US. I just checked Google to try and find out which station is airing the show in Aus but I came up dry. There were lots of remarks about how Australia will have to wait and that it's getting picked by either Foxtel or Showcase but no dates and no confirmations. I think I find different shows because I'm in Canada. Canadians often get to share in American TV release dates while Australians are often forced to wait months before a show airs, if the show gets picked up by Australian networks at all. I think this news is pretty cool. I figured they would leave London eventually, but I won't be super excited until they are heading to Transylvania. I am however, really stoked about Dr. Jekyll and Mr. Hyde which is one of my favourite Penny Dreadfuls. Hence there are a lot of question you ask of shows I have never heard of! I realised you were in Canada as you had mentioned it before. I will keep asking you about new ones so i know which ones I want to watch if and when they come on! Penny Dreadful S1 was tops. I'm so looking forward to the next season to see which new characters pop up...and to ogle Josh Hartnett and Timothy Dalton some more. So excited for the new season. So many great Gothic fiction characters they could go with for the next season...but so long to wait.